Where is the closest dealer to me? Please use the dealer locator at the top of the page to locate the dealer nearest you. Where do I find my Manufacturer’s Warranty Number? 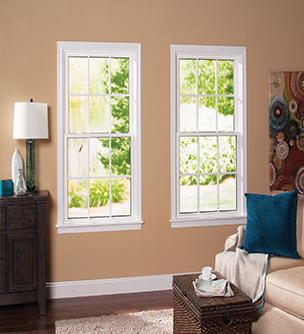 Manufacturer’s Warranty Number can be found on the main frame of most of types of Sunrise Windows and may be found on the sash sticker that run along the side of the sash. I will appear as a 6 digit number followed by a (-) and a number. What product can I use to clean my glass or frame? Clean window and door frames with a mixture of mild dish soap* and water. Abrasive or caustic cleaners or solvents are never recommended because they might cause permanent damage to the frame finish. Mild, nonabrasive soaps* are usually safest for most dirt and stain removal. *Ivory® is an example of a mild dish soap. Always test cleaners in an inconspicuous area first. Mr. Clean’s Magic Eraser is great for cleaning frames. Why do I have condensation on the inside of my windows? Why do I have condensation on the outside of my windows? I was washing my windows and now I can’t get it to go down all the way to get it to stay up. What is wrong? The Pivot bar on the sash is not properly placed inside the frame shoe. Try tilting the windows back down and take it out of frame. Return it to the frame making sure that the metal pivot bar is fully engaged in the frame shoe. Do you have a service person in my area? If you have a service issue you should contact your dealer/installer. They will be able to order service parts for your Sunrise Product. How do I get service for my window if my dealer is out of business? If your dealer is no longer in business you can reach us through our website (Warranty link) and a service tech will contact you with information on ordering parts. In accordance with our Warranty, Sunrise will ship parts to the closest dealer at no charge. If the homeowner chooses to have it shipped to their home address then there will be a shipping charge that will depend on the part shipped out. On rare occasions other Sunrise dealers will perform services for dealers that are no longer in business. In cases like this the Sunrise Dealer performing the service may charge the homeowner a fee to perform this service. Why does my window look foggy in between the glass? If you see fog or brown spots that cannot be cleaned off the glass and appear to be between the glass panes you are most likely experiencing a seal failure. This occurs when the sealant between the panes of glass breaks down and exterior air begins to enter the space between the panes. If you have argon or krypton gas between the panes it will leak out and your window energy efficiency will begin to decline. Under the Sunrise Warranty you will be eligible to receive a replacement unit. My windows will not lock. What is wrong? The first step is making sure that both sashes are push all the way into the frame pocket. If you experience this right after cleaning your windows make sure that you reinstalled the sashes correctly. If you are still experiencing issue you should contact your dealer/installer and finally if they are not available please contact us through our website. Have a question not addressed here? Contact us.